Well, finally yesterday they decided to try Casey off the ventilator, since she had a couple days of lab work and chest xrays getting better. Since they took out her tube, she has been having a lot of trouble keeping a consistent saturation of oxygen in her blood – nothing extremely low, but below the comfort zone for the ICU doctors. After a lot of different tests and therapies and positions tried, a nurse noticed a pattern in Casey’s breathing linked to her desaturation. After changing some settings, we saw that every 4 minutes Casey would stop breathing for 11 seconds. Since she normally takes very shallow breathes, this is very hard to to see, but it is definitely apnea. 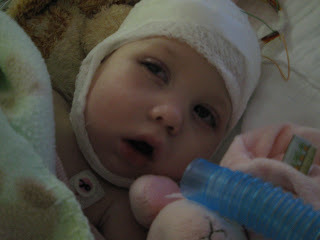 After she starts breathing again, her oxygen saturation jumps back up to almost 100% and the cycle starts over. Now their attention has turned to why this is happening. There are different theories, such as Casey having difficulty clearing some of the narcotics given to her, which are common to sedate babies on ventilators. Another possibilty is that seizures are triggering the apnea, since the brain stem does control breathing and Casey’s damage at birth covers pretty much her whole brain. Or, the apnea could be caused by something else. The doctors will be continuing to do tests to figure this out. We have to be at the hospital for at least another week while Casey finishes her antibiotics, starts her feeding by tube instead of the current IV, and just generally get stronger. Thanks for everyone’s support – we will keep you posted on what we find out!